Each Actifio service has its own log. This is how the different services relate to each other. Local and remote deduplication, replication and communications with remote systems. Primary trace logs for reviewing failovers and node reboots, ethernet status, etc. A set of counters for ongoing system processes. Events during the installation process. Creation and deletion of VDisks before invoking the Flasher. Events during the patch update process. Communications with Tomcat, Actifio database, VMware, CLI, system health, scheduling GC. Disk to remote disk replication operations. Events relating the creation of VDisks. Events that occurred when configuring the SSD. Communications with the Actifio Desktop and the Actifio Resource Center. The sequence number increases as you go back in time. 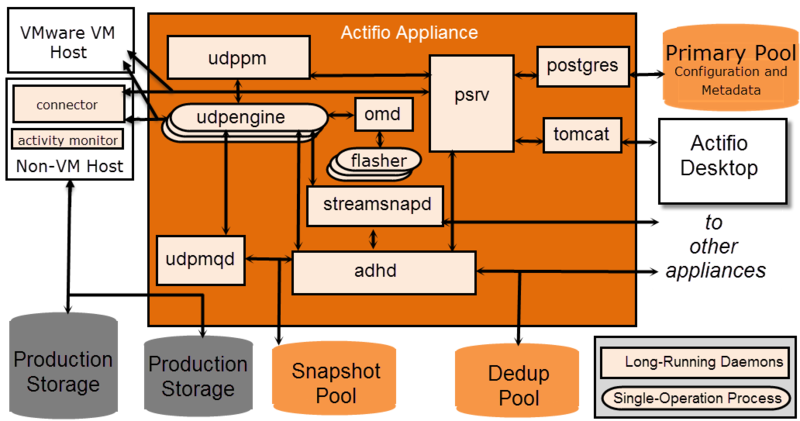 Multiplexes udpengine access to snap storage. Scheduling and operation of jobs. A variety of different logs depending upon the host, but always including UDSAgent.log. The Actifio Connector log includes information such as host OS version/patch revision, HBA make/model/type, firmware revision, CPU/Memory utilization, connector logs, RMAN, syslog, etc.